FREE Gift for orders over $250. 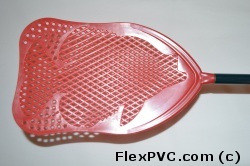 My Fly Rod - This is the ultimate fly swatter. At first you think this is just a novelty item and it does look cool, but in fact this is the last fly swatter you will ever buy. We have used these swatters for 4 years and they are still in remarkable shape. No more heads flying off, no more broken handles, or bent wires. Best of all no more flies!